On January 9, 2016, the new FRC game, FIRST Stronghold, was announced ushering Mechanical Mayhem into an intense six-week build season to design and fabricate a competitive, 120-pound robot. The game is played on a 27’ X 54’ playing field. The goal of the game is to capture the opposing alliance’s castle by attacking it with boulders and surrounding it at the end of the game. Each castle is surrounded by five defenses called the “outer works.” Three defenses are chosen by the alliance, one defense is picked by audience selection, and one defense is permanent: the low bar. Each alliance will have a “secret passage” allowing them to collect ammo (boulders) from their human player stations. Secret passages allow alliances to bypass their own outer works and proceed directly to the opposing alliance’s outer works. Once they cross the other team’s defenses, they may shoot to weaken the opposing alliance’s castle. At the end of the game, if your alliance has gotten at least eight boulders to penetrate the opposing alliance’s castle, you may surround the castle with all three robots to ultimately capture it. Additional points are awarded to alliances who are able to climb the castle walls. When choosing defenses to defend their castle, each alliance will be presented with six different options. The audience will be presented with two different options. In total, there are nine different defenses and more than ten thousand possible field configurations. The Category A defenses are the Portcullis and the Cheval de Frise. The Portcullis is an arch-shaped doorway that opens when lifted. 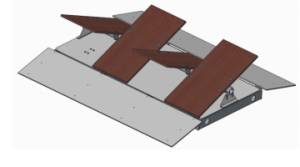 The Cheval de Frise is a series of four independently tilting platforms. The Category B defenses consist of the Moat and the Ramparts. The Moat is a flat channel with metal beams on either end. The Ramparts are two ramps facing opposite directions. The category C defenses are the Drawbridge and the Sally Port. The Drawbridge is a bridge that lowers when you open it. The Sally Port is a door that only opens toward the courtyard. The category D defenses are the Rock Wall and the Rough Terrain. The Rock Wall is a 4-5/8-inch tall beam. The Rough Terrain consists of thirty-one rectangular pieces of steel tubing of different heights. The Low Bar is the only permanent defense and is not included in any category. It is a 16” high steel beam, which is intended to be driven under. There is a curtain attached to the beam to ensure no boulders roll under the beam without assistance from a robot. Our team is excited to see what we can dream up with our imaginations to solve this creative challenge!